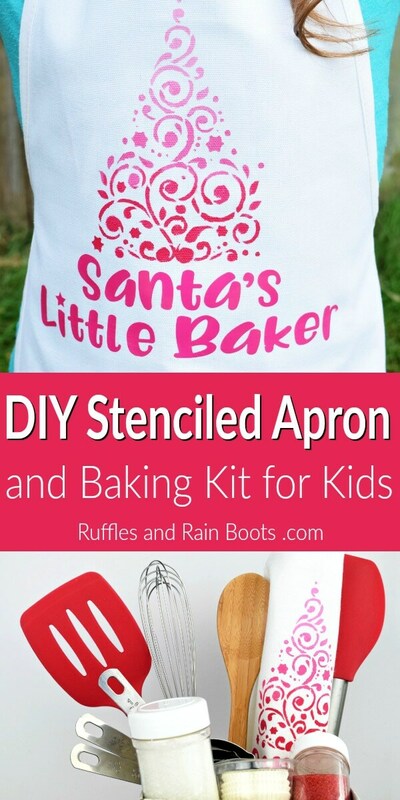 This stenciled kids Christmas apron and Santa’s Little Baker Kit are a great pre-holiday gift. Get the kids in the kitchen and the spirit of the season! Nativity Story Stones and Stenciled Gift Bag – Fun, quick, and kids LOVE them! Snowflake Stencil Card – This is an elegant watercolor and hand-lettered holiday card (coming soon). We love making Christmas gifts here on Ruffles and Rain Boots. Just like these out-of-the-box nativity stones, we like to share creative ways to ring in the holiday season. 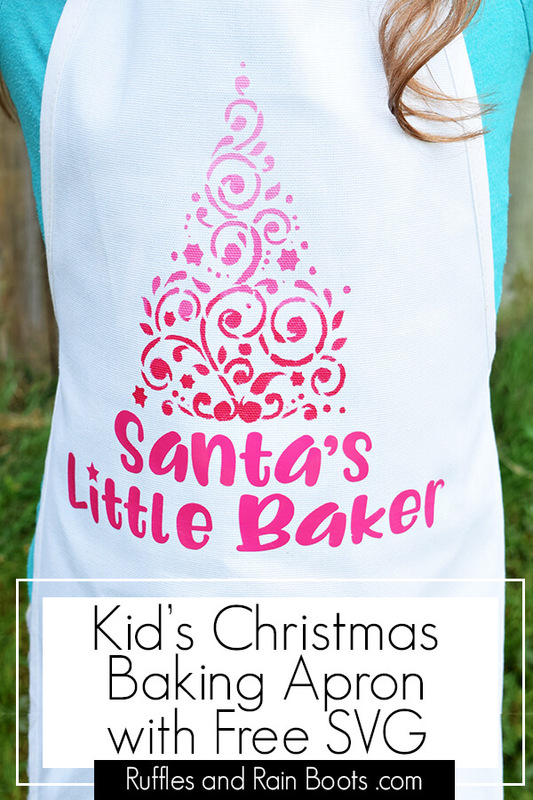 Today, we’re making a fun Santa’s Little Baker Kit, complete with a stenciled kids Christmas apron that is just adorable! 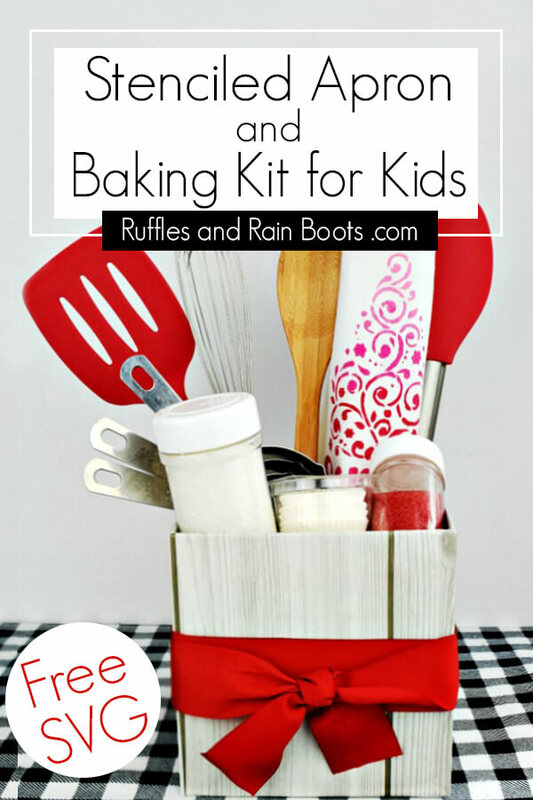 If you’re tired of the same old gift ideas, join us as we share how to make a fun gift for kids. 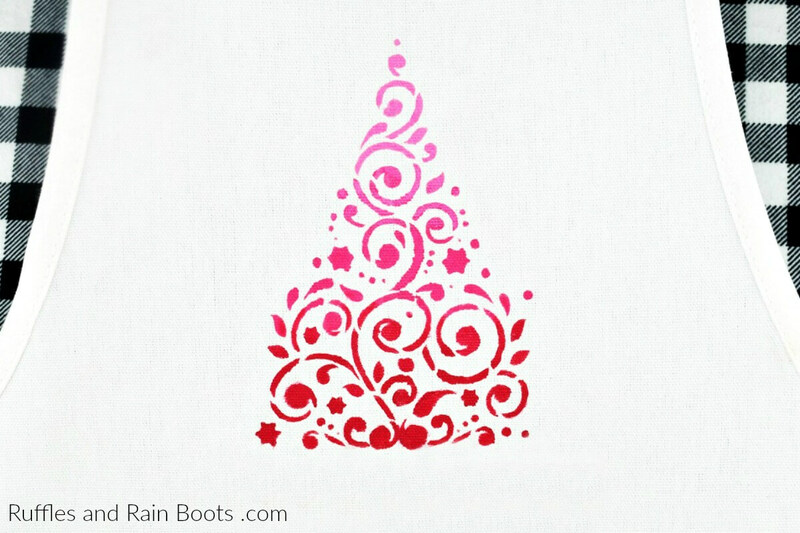 In this short video, I show you how I created the ombre tree for this kids Christmas apron using Stencil Revolution’s beautiful design. And, I teach you how to fix mistakes – it’s such a good tip! To watch how easily it comes together, just scroll up to see the video (mobile) or look over to the right (desktop). This is really such a fun craft! Mix ombre paints. Place red in all three wells of the palette and add increasing amounts of white to two of them. Add the fabric medium, if using. Start with the lightest color at the top of the tree and press down on the stencil while dabbing lightly. Once you have finished the lightest color, move onto the medium hue, slightly overlapping the previous section. Finish with the darkest. Remove the stencil and allow the apron to dry. 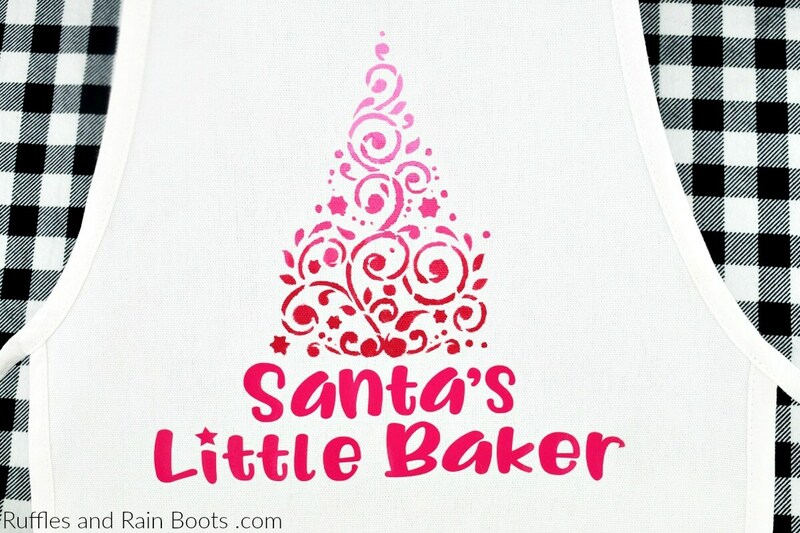 If you have a cutting machine, you can cut the “Santa’s Little Baker” in a heat-transfer vinyl and place it below the design on your stenciled apron. Don’t you just love easy projects? 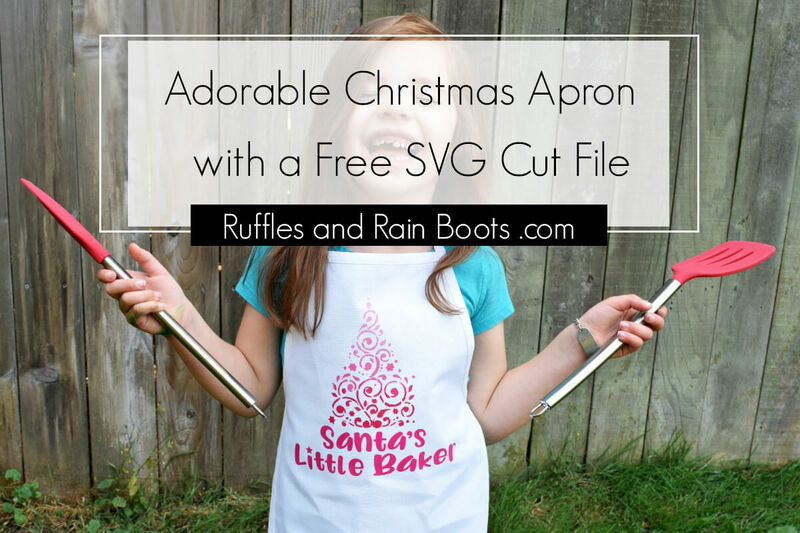 I created the “Santa’s Little Baker” cut file in Adobe Illustrator and included a little star to accent the letter “i.” This free Christmas cut file can be used with all cutting machines because I’m sharing it in SVG, DXF, EPS, and PNG formats. 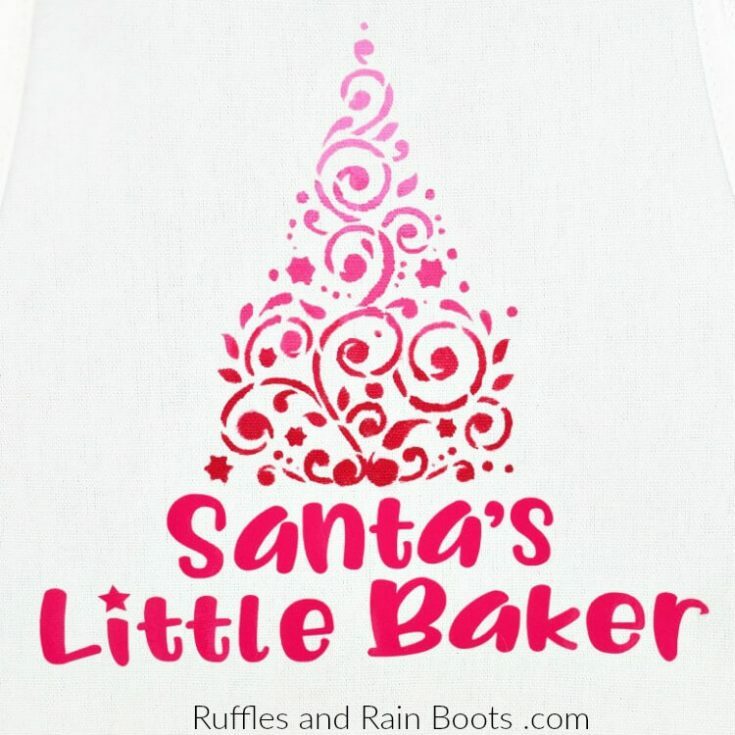 Get the free Santa’s Little Baker cut file here. Each of these items went into a 6-inch square kraft box covered in a wood pattern contact paper. I tied it with a red ribbon and it’s ready for gifting!